Congratulations 2015 ESWG Tournado Champions: – NYSSRA Nordic Inc.
After 3 hard days of racing NYSSRA crowned overall Tournado Champs: Jan Wellford and Rosanne Van Dorn. Jan seemed unstoppable with first, third and first overall. Rosanne excelled in Friday and sunday’s skate races and finished solidly in the top 10 on Saturday (7th). Races were close with racers fighting to the line for seconds well down the finish order. Editors note, NYSSRA members are eligible for points not available to non members. This made a difference for some racers, so don’t forget to join NYSSRA. 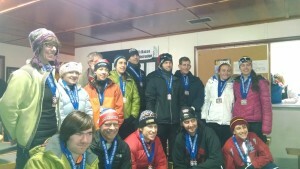 After 3 exciting races in deep soft snow, age group champions were crowned NYSSRA Tournado age group champions. Only 1 Wilkinson Cup race remains (Championships) Most racers have 2-3 races under their belt, so if that includes you, come out and take your shot at the title. If not, just come race the clock for your best time of the day. Well done racers. Rest up, and ready yourselves for (Races at Saratoga Biathlon club next weekend). Good luck to Younger NYSSRA racers at their respective Sectional Championships races this week.